On January 1, the Chouhaiokishiki, or Imperial Court New Year’s morning ceremony, was demonstrated Shurijo Castle Park, Naha. From January 1 to 3, a New Year’s ceremony was held at Shurijo Castle Park, Naha. 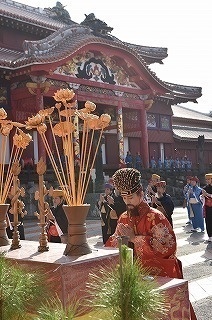 The Chouhaiokishiki, or Imperial Court New Year’s morning ceremony, which used to take place at Shuri Castle on New Year’s Day during the Ryukyu Dynasty, was demonstrated. Many people watched the ceremony and the king and others wearing extravagant clothing. On January 3, the king and queen appeared in the forecourt and Ryukyu traditional dance and music was performed, and tea and amazake were served. Shuri Castle Festival: Iraha elected for role of new King, Ikeda as queen.